Reprints, reprints, reprints. All anybody wants to talk about these days is reprints. Modern Horizons is no exception, and I must admit that I fall into the same trap some days. What seems to get lost in the shuffle is the fact that in the initial announcement for the product is that special emphasis was placed on the new cards being printed, and the fact that most of the set will be comprised of these new cards, rather than cards we've played with before. "At the beginning of your precombat main phase…"
This part of the text box is the thing that many people have been complaining about, specifically that it doesn't do anything as soon as it enters the battlefield. 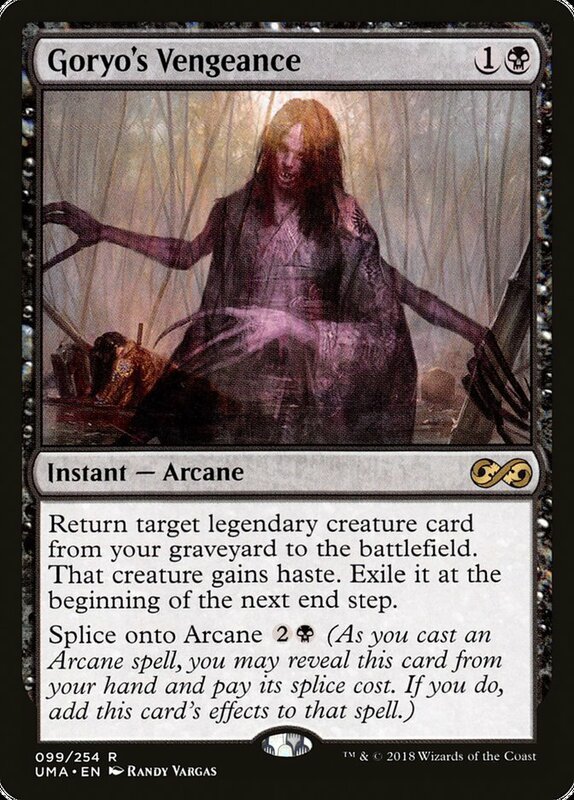 This is a sign that Wizards of the Coast is interested in slowing down Modern a bit and making it a bit less about the immediacy of a card's impact, in exchange for more powerful effects. It's hard to deny that Cabal Therapist isn't a powerful card; if it were a repeatable effect that also happened as soon as it entered the battlefield, it would arguably be better than Cabal Therapy – hardly the spot the card wants to be if Cabal Therapy has been dubbed "too strong for Modern." Taking all of this into account doesn't make it too difficult to ascertain what the goals are for printing a card like Cabal Therapist. There are a ton of ways that Wizards of the Coast could try to introduce new tools to the format with other not-quite-reprints. 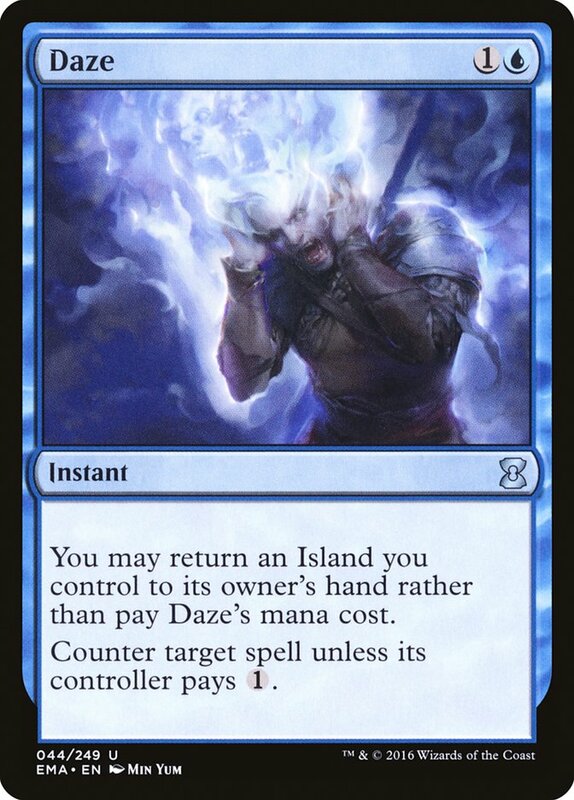 One of the common problems that inevitably comes up whenever people mention free countermagic is that it would simply serve as a way to force combos and proactive things through, and not actually do anything for midrange and control decks that simply want to prolong games. What about a Force of Will lookalike that couldn't be cast to protect a spell? 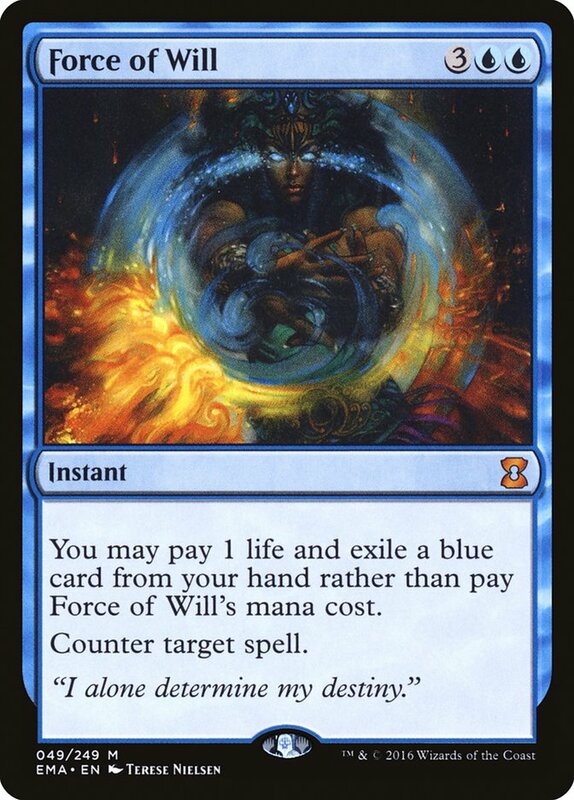 In blue Legacy combo decks like Sneak and Show, Force of Will is used to force through a combo piece, and that isn't possible with something that also exiles the spells of its caster. The biggest problem with this style of card is that it still serves to press an advantage if the advantage isn't on the stack. Tempo decks and anything else that was playing to solidify its advantage on the battlefield would have a heyday with this card. 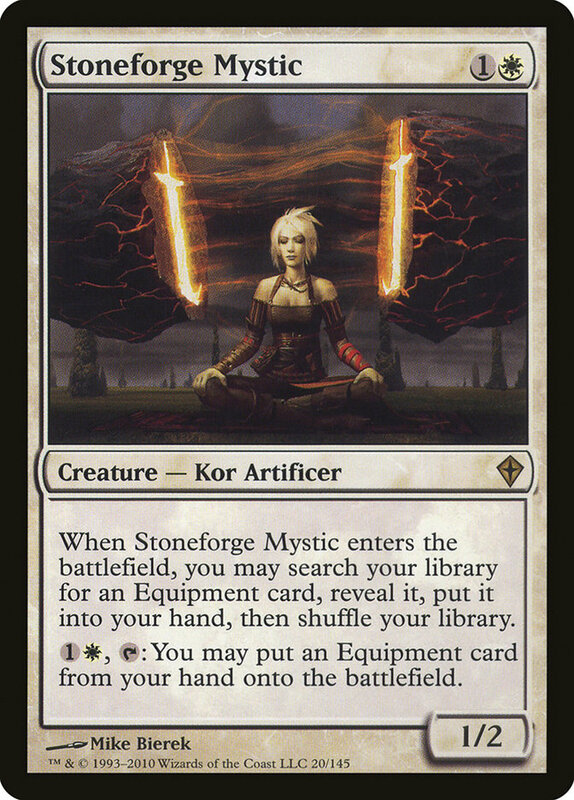 That being said, those kinds of decks are also archetypes that want to play longer games of Magic. If the goal of Modern Horizons is to lengthen the average length of Modern games, this is a direction to look if punishing fast, linear combo decks is a priority. In that same vein, looking at more proactive forms of reaction is an option as well. 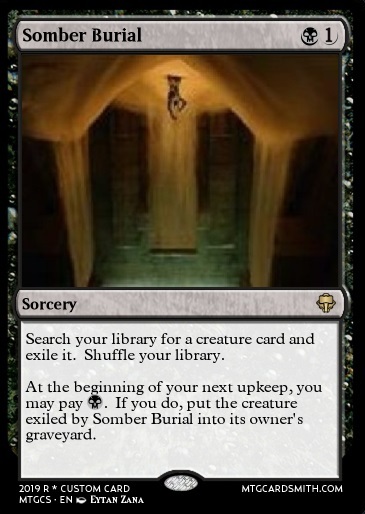 Think of it as the difference between Counterspell and Thoughtseize. Counterspell is a reactive card that forces your opponent to do something before it has an effect on the game. Hand destruction is one of the most common forms of proactive disruption in Magic. It's proactive reaction because, while it isn't advancing the game towards a conclusion, it is able to answer resources from the opponent without them having to meet any conditions. 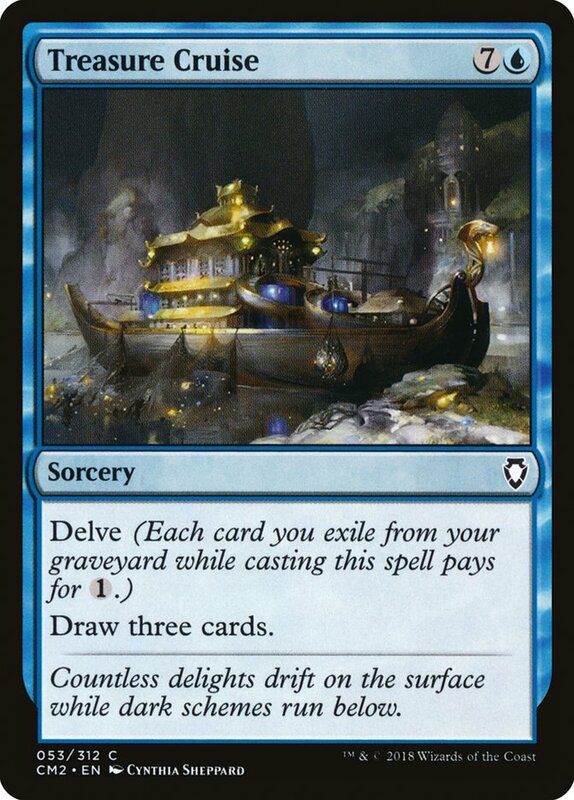 The issue with a card like Hymn to Tourach in its original iteration is that it has the ability to create non-games by discarding all of the lands in the opponent's hand. 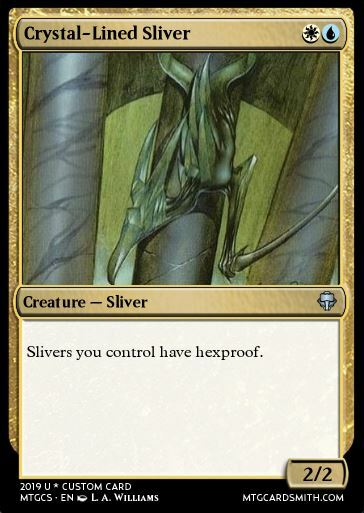 The above card, as proposed, is still proactive card advantage that reduces the number of resources the opponent has available, thus lowering their odds of being able to assemble an early-game combo. Make control decks better at answering creatures. It's fairly unreasonable that Standard frequently has tools that are on-par with Terminate, but Modern has to settle with similarly powered answers, or have the huge drawbacks and conditions of cards like Path to Exile and Fatal Push. 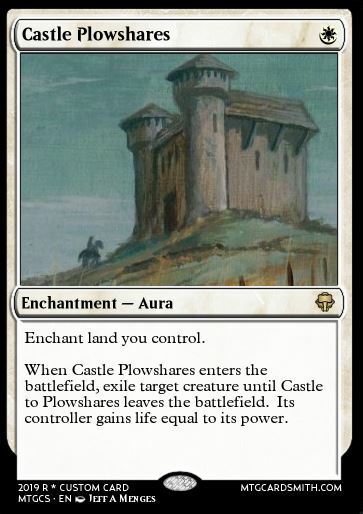 Castle Plowshares not being functional with Snapcaster Mage and not being an instant is going to keep a clear line of difference between this card and Swords to Plowshares in formats where Swords is legal. Having a card in the same vein as Swords to Plowshares that is markedly weaker is a step in the right direction. There are some fixes that could even water down this version of the card, like it needing to enchant a nonbasic Plains card, for example. That way it's more easily answered by Field of Ruin, Fulminator Mage, and company. The point here is that, despite Fatal Push and Path to Exile being some of the best creature removal ever printed, it frequently isn't good enough, and a new option for control decks would be a natural inclusion in a set that's looking to give a boost to decks that have historically struggled. It's hard to imagine that Cabal Therapist is the only card in Modern Horizons that WotC is planning on using to demonstrate that powerful cards are worth investing time into. 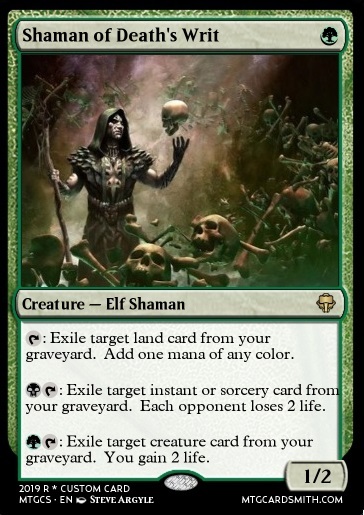 One of the ways to decrease the popularity of decks like Dredge is by introducing new tools to graveyard strategies that are powerful enough to incentivize people playing more dedicated hate. 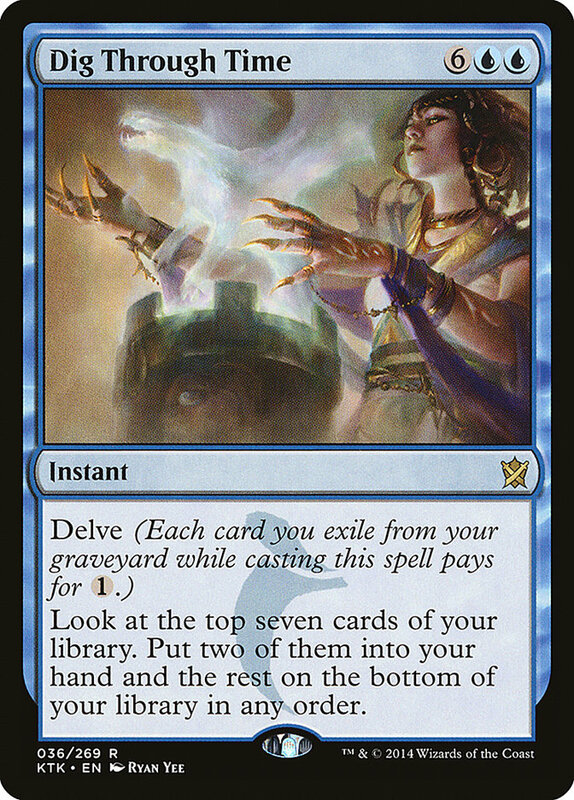 Like Cabal Therapy, Entomb is too powerful to see the light of day in Modern, but creating a card in a similar vein that requires additional investment is closer to the speed of the format. On top of that, the card is still incredibly strong. Many decks would be interested in this style of effect, but they would be the linear combo decks that have consistently been right on the outside of popular tiered archetypes. The goal of increasing the power of these strategies is to try to introduce cards that operate on a similar axis as other decks that WotC has identified as problematic, letting those decks become players and letting the ripple effect do its thing. Another approach to slowing down the format is creating cards that are so powerful that there's proper incentive for reaching the middle and late stages of the game. Serra the Benevolent is a step in the right direction for this. Worship in emblem form is no joke and plays into the delayed power idea. The biggest issue that midrange-y planeswalkers face in Modern is that having cards that don't do anything in the earlier stages of the game is too high a draw back for too low a payoff. Modern decks are built with a third-turn Karn Liberated in mind. What hope does Gideon, Ally of Zendikar really have? 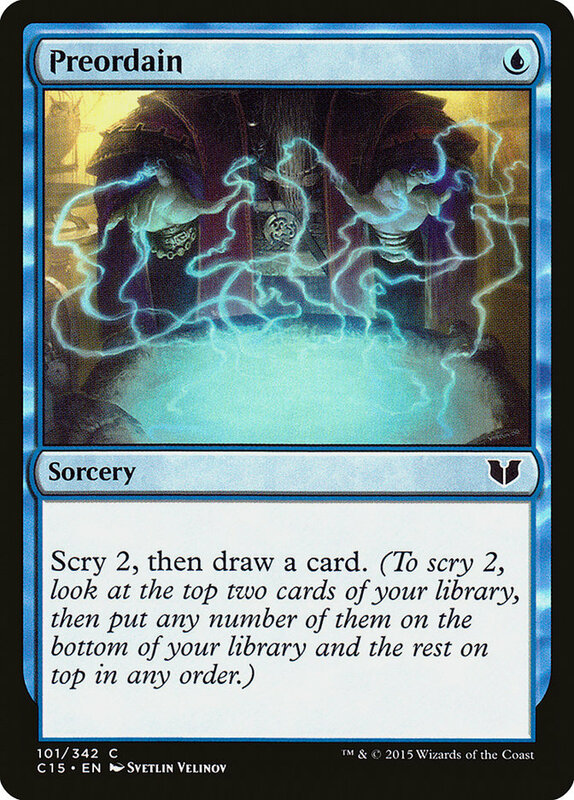 Despite being a powerful card, the rest of the format is so fast that it's hard for planeswalkers to get the value they would get over several turns. One of the drawbacks to control decks in Modern is that there are so many things that need answering, and the longer a game goes, the more threats that control decks are expected to deal with before their end-game comes online. 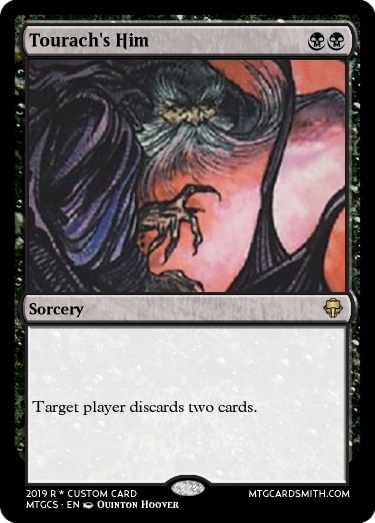 Cards that put their pilot from the early phases of the game directly into later stages of the game are a natural way to have cards in future sets have a higher impact on Modern. 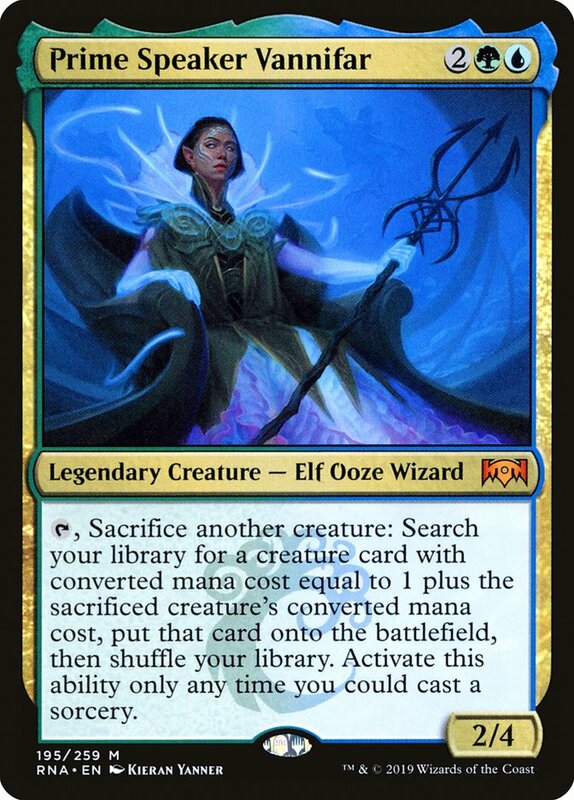 The biggest reason that decks are able to beat up on Karn Liberated is because the entire deck has to be dedicated to cranking the planeswalker out ahead of schedule, without doing anything else to interact with the opponent in the meantime. 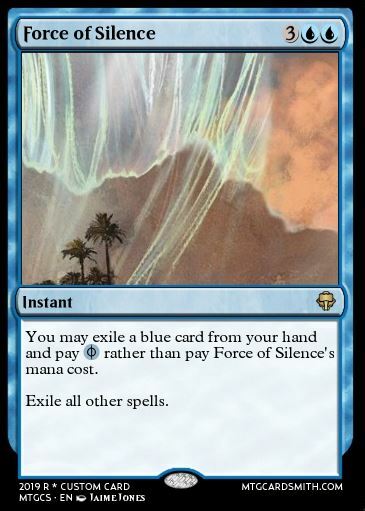 The Serra Avenger clause on this card is to ensure that it can't be abused by prison strategies or in the ways that we're used to seeing fast mana implemented. Having similar restrictions to keep cards firmly in the "long game" decks is a little shoehorned, but it's a safe way to print powerful tools for these archetypes that could otherwise be utilized by strategies that are lower to the ground. 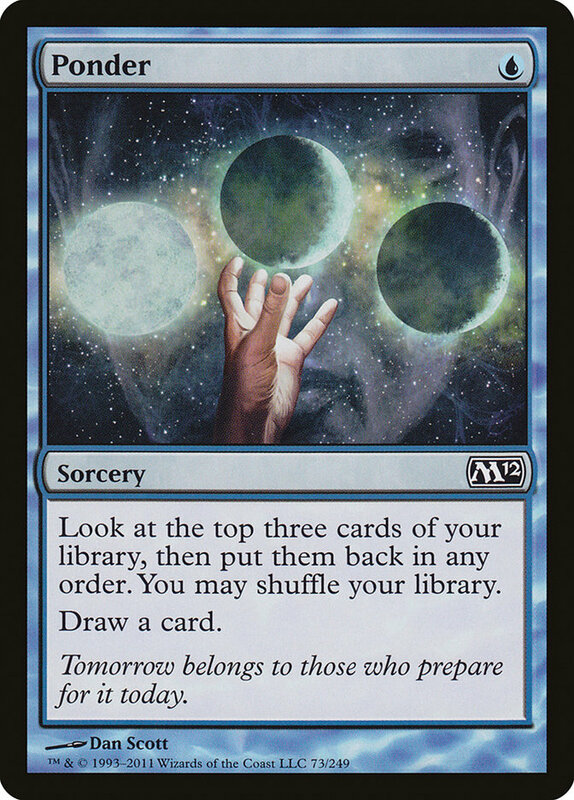 Some cards in Legacy simply aren't templated how they would be if they were to see print today; color pie concerns are a bit stricter, power levels of some cards could be adjusted, and a new card could simply be a strictly weaker version of a card that's already in circulation. 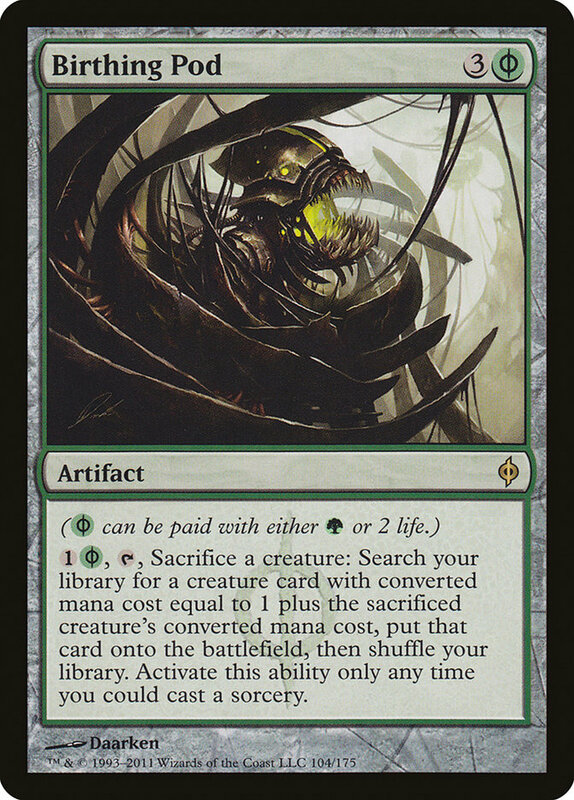 If you squint hard enough at Vannifar, you can see the family resemblance to Birthing Pod. 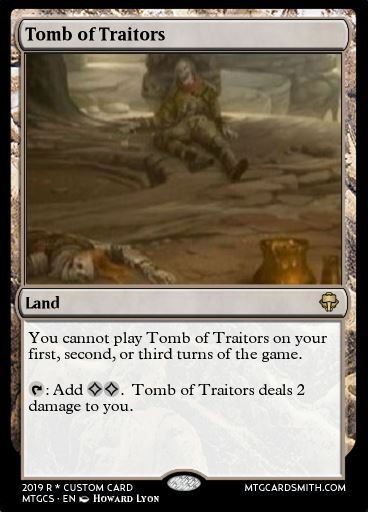 This isn't specific to Ravnica Allegiance, but it does show WotC's willingness to rehash old ideas. 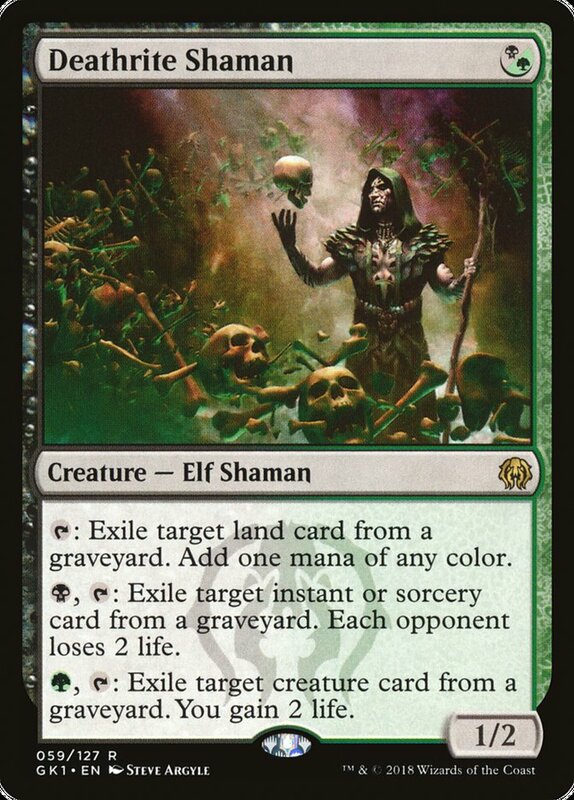 In the same vein as Tomb of Traitors above, something close to Deathrite Shaman, fixed to be more color-pie appropriate and with its abilities being toned down in terms of power, could be what green midrange decks are missing to compete with the unfair decks of the format. This is the type of card that checks multiple boxes. On top of the Slivers tribal deck in Modern, this gives a new version of Crystalline Sliver that doesn't affect the opponent's creatures. 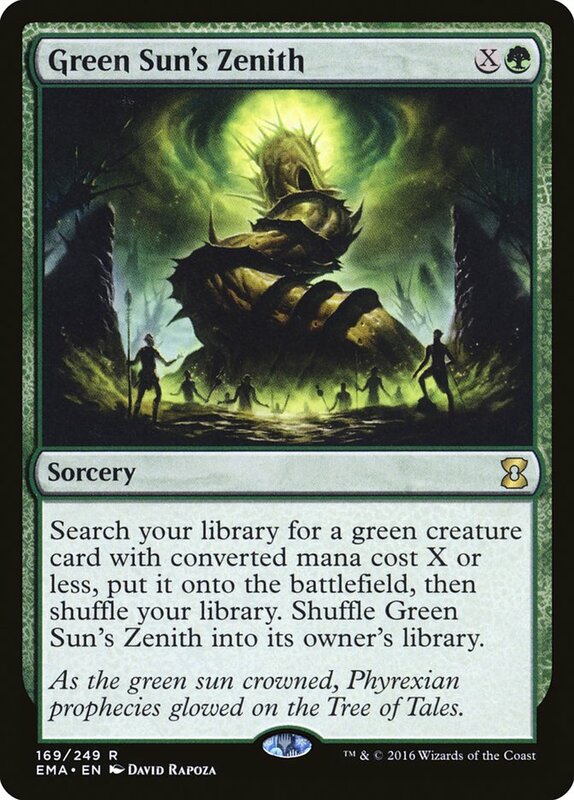 Past that, it even provides another tool for the Azorius Hexproof deck in Modern, which is, ironically, a slower and more interactive deck than several things that we're seeing in the format today. 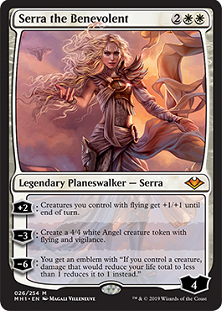 Cards that pump up multiple archetypes while appealing to older players are exactly the type of thing to expect from a set that plays to nostalgia by previewing a Serra planeswalker card on its initial announcement. These approaches are all cards that could make their way into packs of Modern Horizons, and there naturally will be countless types of cards that haven't been covered here. The important thing to note about all these cards is that there is an expressed purpose behind all of them. When coming up with hypothetical cards, people get too caught up asking themselves how broken or playable a card would be, instead of asking themselves if it actually makes the game better. Use this as a framing tool for trying to suss out what kinds of cards WotC is most likely to include in Modern Horizons.